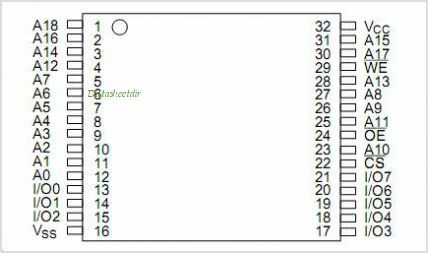 This is one package pinout of HM62V8512CLTTI-7,If you need more pinouts please download HM62V8512CLTTI-7's pdf datasheet. HM62V8512CLTTI-7 circuits will be updated soon..., now you can download the pdf datasheet to check the circuits! KM68V257C, 32kx8 Bit High Speed Static Ram(3.3v Operating), Evolutionary Pin Out.